LOOKING FOR THE BEST TEACUP, TOY & MINIATURE SCHNAUZER BREEDERS?Let SoCal Schnauzers Help You. SoCal Schnauzers has become a cornerstone of the Miniature, Toy & TeaCup Schnauzer world. We have been breeding and raising Schnauzers for over five years now. We take great pride in our lines and treat every puppy like they're our own. An ultrasound is done on every female at 4 weeks of gestation to determine if they are pregnant. Our parents are always on site and live in our home, not in kennels. All of our puppies come with a lifetime health guarantee if you keep your puppy on the same food and vitamin supplement that we have them on. Every puppy comes examined by my vet and altered at no extra cost to you. Schnauzer Breeders should only breed the best. Here at SoCal Schnauzers, we don't just breed for fun or to make money; we breed because we love these dogs and want the best possible quality therapy/companion dogs out there. Coming from only the purest and finest of bloodlines, we breed and train our Schnauzers to be the most amazing animals that they can be. With careful attention paid to the heritage, disposition, and health, of our dogs, we ensure the most excellent qualities are bred into our Miniature Schnauzer puppies. Schnauzers have captivated my heart, they are magnificent animals and have such fantastic temperaments. I treat my dogs like my children. I take pride in them, and it shows through my breeding program. We are a family-based business that allows us to socialize our miniature schnauzer puppies on a daily basis. All of our puppies are born and raised in our home and are watched over carefully by our family. I used to work for a Doctor at Palm Desert Pet Hospital for a few years. I learned a lot from them, so I am very educated in the field of animals. My entire career has been animal based, starting at 10 years old I began volunteering at shelters and stables. My first job was at a grooming salon as a bather; the lady taught me how to groom. My third & fourth job was at a vet hospital; you name it I have probably done it. If you put that all together, I have over 20 years of experience with animals. I adore my animals and love what I do. All of our puppies are meticulously taken care of by my family and me. Anna, Mary, Ethel, Sarah & Patmore, Martha, Phyllis & Sybill are All Projected to Have Puppies in May to June. We Now Do Early Neurological Stimulation's "Bio Sensor"
Homes Across the U.S. & More. * No house visits to see puppies are allowed until they are at least six weeks old and have at least one vaccine for the their safety. Visits are allowed to see adults anytime. * No dogs are allowed on my premises. Please do not bring them along on your visit to see my pups. * If I don't have what you want, and you don't want to wait for one to be born, please let me know. I may be able to help you find what you are looking for. * I require full payment by puppies 6th week of life. * I have several shipping options if needed. Please check out the upcoming litter's page to learn more. We have DNA test results for every dog we own! All of our dogs have been tested for (Over 178 different genetic issues). The results are posted under each dogs name and picture for your convenience. We still offer an extended health guarantee covering any genetic, hereditary, or congenital birth defects for the lifetime of your pet. WE STRIVE TO BREED THE HEALTHIEST PUPPIES AVAILABLE!!!! Each and every one of our puppies start early neurological stimulation from 4-16 days old. Five benefits have been observed in canines that were exposed to the Bio Sensor stimulation exercises. Please visit the puppy development page for more information. Check Out Our Dames/Sires Page for more info. Sir. Frederick is a star! He is in a PetSmart Grooming Commercial that Has finally aired.Check Out The Sires Page To See More. Sophie and Phyllis's pictures are on bags of Authority dog food in PetSmart!! Some colors can only be registered via mail or email to colors@akc.org. If you choose to email, you must upload front and back side of the filled out registration and two pictures of the dog, one front view & 1 side view. We take all major credit cards through the Square Reader if you choose to do so. I will need to add 2.75% to your total when swiping, tapping, or dipping your card in person. When entering the card information manually, I will need to add 3.5% extra to your total. If sending an invoice 2.9% will be added. You can also deposit money into my bank account to save the extra charges from Square or you can send a money order, or cashiers check in my name. I do accept PayPal but prefer not to use them for final payments. My daughters and I suffer from pet allergies, therefore we can only have hypoallergenic dog breeds in our home. We have an elderly shih-tzu who is slowly deteriorating, so we made the decision to seek out a puppy to add to our family. After researching hypoallergenic dog breeds, we fell in love with miniature schnauzers. I googled local schnauzer breeders and found SoCal Schnauzers in Yucca Valley, CA. I took my daughters to visit Brittany’s home and allow them an opportunity to engage with her puppies. I wanted to be 100% sure but they would not have an allergic reaction. Fortunately, all went well and before we knew it, we put down a deposit for the next upcoming litters.A few short months later we brought home an eight week old, chocolate brown, male miniature schnauzer and name him “Jasper”. Brittany provided all the documentation that we would need to care for him in our home, keep him healthy and safe, and was available to answer questions via text or phone call as needed. She provides a dog food account that can be easily transferred over to the new owners, along with the recommended vitamin intake for this particular breed. Our vet was particularly impressed with the packet of documentation that accompanied Jasper, and complimented us on selecting a legitimate breeder. She provides AKC registration, ensures to “chip” each puppy before they go home, has their tails clipped and first round of shots completed.Jasper is the heartbeat of our home, and one of the best investments we’ve ever made. Schnauzers are an intelligent, energetic and fun breed. I highly recommend Brittany and SoCal Schnauzers if you are in the market for an adorable, loving, and well bred miniature or toy schnauzer. In February of this year I was searching for a miniature schnauzer after my last baby got sick. I was on the AKC website and came across SoCal Schnauzers. Within minutes of sending a message to find out if there were any availabilities for puppies, I received a phone call from Brittany. She was so sweet and very informative. As soon as the puppies were born she sent me a message and let me know about photos being posted. She has been so gracious since our first contact. She sends me videos of my baby girl, Riley. Not to mention, she welcomes me to her home to visit Riley often. She shows so much love and dedication to her all of her pups, and cares so much for all of them. Thank you so much, Brittany, for everything! Brittany is amazing! She raises her dogs with such love and care that they come to you so full of love its a joy. She makes the purchasing process very pleasant and provides all the info needed to be sure you are getting a healthy pet. She is available for questions whenever needed and makes sure your new addition is doing well when they go to their new home. You couldn’t find a better breeder of schnauzers. We’ve raised 5 schnauzers past and present and I can honestly say Brittany breeds awesome dogs. We recently purchased a very cute salt and pepper miniature schnauzer from Brittany with SoCal Schnauzers. We had never purchased a full breed dog and knew nothing about the process. Brittany displayed exceptional patience, knowledge, experience and professionalism during the entire purchasing process. During our initial visit to her breeding location, it was very apparent that Brittany cared about the puppies as a first priority. She really wants the puppies to go to a loving home. We asked way too many questions and Brittany answered everyone of them. She still is available for questions now that the puppy is home. We love our new puppy and I strongly recommend Brittany and SoCal Schnauzers, particularly if it is your first time purchasing a full breed Schnauzer. Brittany will treat you like family. I don’t know if there’s any words that could truly explain my feelings regarding SoCal Schnauzers other than truly amazing!!! From start to finish the process was a breeze. I submitted my application in August of 2018 and the very next day Brittany called me. I was in awe at her quick response. She was so pleasant to speak with, she honestly made me feel like I’ve known her for a very long time. Brittany always kept me updated regarding the process and what to expect. Yesterday 2/2/2019, we drove down from Northern California to Southern California to pick up our baby in the mist of a California storm. As we were on the road Brittany kept checking on us to make sure we were okay, since the weather was horrible. And when we arrived Brittany welcomed us into her home with open arms. She made us feel like we were old friends that haven’t seen each other in a long time...You can see how much love & passion that she has for her puppies. It’s definitely not about the money to her it’s about connecting families with a great companion. She truly LOVES what she does and you can definitely tell by the way she cares for her pups. When I first held my pup I instantly fell in love. We received a puppy pack that was filled with many goodies to get us started. And the icing on the cake was the birth certificate and the family history certificate that you receive for your pup, I was like OH MY Goodness you can’t get any better than this... And once we arrived home with our pup who we named Winter walked out of her kennel and my soon to be 10 year old daughter busted out in tears (gosh I wish I recorded that) and all she kept saying was “She’s so beautiful”.... My daughter Jordynn will be 10 years old on February 9th and she said this is the best gift ever! Brittany (SoCal Schnauzers) thank you so much for making my entire household feel special! You are the BEST! If you are looking for a professional breeder you can’t go wrong with SoCal Schnauzers!!! My husband and I cannot speak highly enough of SoCal Schnauzers. Brittany is the most professional, knowledgeable and kind breeder and we feel so lucky to have come acrosss her after lots of trial and error in our puppy search. Our little guy has the sweetest temperment - he is energetic, outgoing and playful but at the same time is a total snuggler that loves to be loved. Furthermore our dog is unbelievably cute. Not to brag, but we literally get stopped every day by other dog lovers asking about our little man/wanting to take pictures! Brittany's keen eye and hard work when it comes to breeding shines through in every way. My advise for anybody in the market for a miniature schnauzer is to stop your search and go to the best at SoCal Schnauzers. You will not be disappointed and will be very happy with your decision! We lost our 14 year old Miniature schnauzer this past November. My husband and I were heartbroken,, we never lost a pet before! Tom did his research without telling me and then once decided that's what he wants for his 75th birthday I totally agreed, there couldn't be a better gift than having another Schnauzer in our lives! Our Bella was available right away, so we took a road trip from Las Vegas to Yucca CA to meet this lil gem! Brittany was very accommodating all the way through this exciting process! she is very professional, personable and definitely an incredible breeder! We now have Bella at her new home in Las Vegas for 6 days, she is beautifully adjusted! In this short time, she has been spayed, fully potty trained in our backyard, eating her new food and healing incredibly well! We fell in love with all of Brittany's puppies, that we decided to commit to another puppy in the near future! Thank You, Brittany, for doing such an incredible job breeding these amazingly healthy, smart Schnauzers so they can fill many people's hearts with so much Joy. Our family experience with SoCal Schnauzers was simply exceptional. Britany Price’s work experience makes her a truly loving, caring and nurturing breeder. She loves what she does best and doesn’t do it solely driven for profit. I truly respect all her hard work because not only she is a mother of five beautiful girls, but she manages to also care for all of her sires, dames and pups which she loves. She is very passionate and knowledgeable about her job; the perfect combination to trust in everything she does. As busy as her life is, she will always be there for anyone to answer questions and manage crazy business hours if she needs to. I recommend anyone out there in search of a beautiful schnauzer to Brittany Price at SoCal Schnauzers. Even if the drive is a little far from wherever you are; it’s totally worth it, for you know your puppy will be in great hands while you are waiting to bring it home. Thank you Brittany for all the great job you do!!! And thank you so much for our Rocket! We are very happy we chose you. You are simply the best! The best puppy my family has ever had. Brittney Price does an exceptional job in breeding, nurturing, & caring for her puppies. Her home is a clean & safe environment as well as welcoming when we received our puppy. She went above & beyond in keeping up updated with calls, texts, & pictures since our puppies birth and through our pick up date. We appreciate the follow up support and calls even a year later. The best & smartest & healthiest puppy our family has ever had. Highly Recommend!!! We found Britney on a local FB page announcing a litter with strong hopes of a white pup. She kept us informed the whole time and even though Sophie didn't produce any white females we choose a beautiful salt and pepper female. Britney invited us over to pick our pup. Her home was clean with the prevention of any germs and her dogs were so sweet, friendly and loving. She sent us pictures and live videos on our pup under her care. And when we picked her up she had her first haircut, was chipped and first round of shots. She sent us home with a puppy pack and the next day we got a report from our vet of a very healthy, good temperament puppy. Anyone looking for a Schnauzer puppy would not be disappointed with Britney or her beautiful puppies. When our Lexie May needs a playmate we will be contacting Britney again. We recently purchased a baby boy, black and silver schnauzer from Brittany and couldn't have been more impressed or please with the whole process. Brittany is professional, friendly and we couldn't have had a better experience with her. She clearly takes pride in her pets, and the babies she breeds. When we picked up our precious little one I respected the time she took to walk us through all his paperwork to include shot records, AKC, and microchip information. I was very impressed with all the puppy goods she provides to new owners, in my opinion, it speaks to her love for her animals and what she does but more importantly, her concern for ensuring new owners are well prepared to take their new baby home. I highly recommend her and believe anyone who purchases a schnauzer from her wouldn't regret it! Thank you, Brittany, for our little boy, he is such an awesome addition to our family. Brittany Price, SoCal Schnauzer owner, really is what you see here in other reviews. She is a very knowledgeable breeder and has a special relationship with all of her dogs. Brittany was very helpful from the get-go and has continued that relationship even though I have brought my little puppy home. I have no doubt that I can call her for advice at any point and she will continue to be one of the most responsible, friendly and helpful breeders I have ever dealt with. I highly recommend SoCal Schnauzers for your next fur-baby! Thank you, Brittany! We brought our puppy home today after working with Brittany since last Sept! I found her through a google search and reached out to her after being impressed with her very informative website. She doesn’t skip a beat when it comes to any details! She doesn’t leave anything out! She is honest, warm and available all the time! Communication has been stellar the whole time as well as lots of pics and videos so you can you enjoy this journey along the way! We have had so much fun getting to see our puppy grow as she made us a part of it along the way! She loves these puppies like her own and we could clearly see that when we did a home visit at 6 weeks... it was schnauzer heaven and you could see how well loved all these doggies were. It was very heart warming! Brittany has shared lots of knowledge and tips with us. She has made herself available this whole time and I have no doubt that if I need something she will be my first contact! We have four schnauzers now so we are showering all of them with love. When we choose to add another fur baby Brittany will be my go to for sure! Thx so much for everything! Bailey is already settling in her new home! 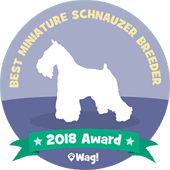 We were deemed California's top Miniature Schnauzer breeder for 2018 and given this award. I am Proud to Announce that we are part of AKC's bread with H.E.A.R.T. Program. We are required to do testing and are inspected every 1-2 years. We have many certificates for completing educational classes. Also, my vet inspected our facility and rated us in the top 5% for cleanliness, safety and overall how we run our business.